"Mondika" is the story of traveling to the Democratic Republic of Congo in January, 2013 to track lowland gorillas. This short story won a gold award from Travelers' Tales for best travel writing in 2014. For three hours we trek single file through the jungle. It is hot, humid, and there is no path. Our leader, Ngunda, a young male pygmy, hacks away at the dense brush with a machete as long as he is tall. I am right behind him. His head is no higher than my chin. I give him and the machete plenty of room. Behind me is Antonia, then Paul, and at the end of the line, Ngunda’s brother, Benga. Abruptly, Ngunda halts. We have come to a swamp filled with black water and mud stretching out in front of us for as far as the eye can see. Paul confers with the two pygmies in their language. He then tells Antonia and me that the trail goes into the swamp and we can follow, or give up our tracking and return to camp. Antonia and I look at each other. Neither of us would even consider entering that swamp if we were not on a mission to see lowland gorillas here in the Democratic Republic of Congo. Amazingly, we do not debate going forward or back, we debate whether it would be better to enter the water with our hiking boots on, or take them off. Since my checked luggage never made it to the Congo, I have access only to the shoes on my feet and I know that nothing really dries in this humid jungle air. We quickly decide to do as the pygmies and Paul are doing, and enter the swamp barefoot. As I step into the opaque water, my toes squish down into mud and the water comes up to my knees. I hope it is only mud. I look at Antonia and realize because I am much taller, the water is thigh high for her! As we follow Ngunda around bushes and trees protruding up through the water, I force myself to focus on putting one foot in front of the other and not think about crocodiles and all the varieties of snakes that could kill me in an instant. I literally grit my teeth and refuse to let my mind recall all the African horror stories I have heard over the years about flesh eating fish, fresh water worms that penetrate your skin and make their way to your heart, and other parasites that bite and sting and make you blind or paralyzed. Antonia and I both have cameras around our necks, but we are so intent on getting through the swamp that we fail to take even one photo to commemorate this adventure. Finally, we reach the end of the water and mud and climb up onto dry land. Antonia has a long bleeding cut on her shin but otherwise we are okay. We wrap a bandana around her wound and onward we march. We continue another thirty minutes, and suddenly, walking through a cluster of very dense trees, I am face to face with a gigantic male gorilla, the silverback. He is on all fours, but since his front legs are longer than the rear, he looks like a runner crouched in position waiting for the starter gun to go off. His back is silver and he is enormously muscular, and I guess his weight at over five hundred pounds. These lowland gorillas are the largest of all gorillas. My heart races. We stare into each other’s eyes. I see intelligence and curiosity. I am mesmerized. Then he slowly lowers himself to the ground, leans on his elbows, and, still staring at me, picks his nose. This I do photograph. The backs of all male gorillas turn that silver color when they are about eighteen years old, hence the name silverback. Since there is generally only one male gorilla in a family group, or troop, many people think the name silverback refers to the troop leader. This troop we have encountered is thirteen strong, all females and babies except for the silverback. We watch them for several hours. Most of the time they eat or nap. Occasionally, one climbs a tree and sits looking out over the jungle. One female slowly and methodically picks termites out of a rotten log and eats them one by one like M and M’s. She sits on the ground with her baby peeking at us over her shoulder. Her round, protruding belly is covered with some of the white rice like insects she has dropped. Another female pulls out roots and eats them as if they were hors d’orves at a cocktail party. Suddenly, two of the females scream at each other in shrill, angry tones. Before they break into a fight, the male leaps to a standing position on his back legs, and in a move right out of a King Kong movie, thumps his chest with both hands. He bellows loudly. The females immediately quiet down and back away from each other. The silverback lies down in the shade, rolls on his back, and goes to sleep. Two females walk off into the brush with their babies on their backs. It gets hotter and hotter. The humidity rises and little bees the pygmies call sweat bees swarm around our faces, clustering mostly around our eyes and mouths. Benga gives me a little jar of tiger balm and indicates I should put it around my eyes. I do, and it helps some. After two hours, our time with the gorillas is legally over, and since most of them are now taking their siestas, we leave without protest, knowing we will be able track them again tomorrow. We start back to camp and I am relieved to learn we do not have to go back through the swamp. The Democratic Republic of Congo is not for everyone. Wildlife Conservation Society manages three national parks there with the Congolese government. Antonia and I and two other travelers are trustees of WCS and we are here to visit the parks. Paul is the WCS country manager for the Congo. He has six hundred employees in the country and all but five are Congolese. WCS is headquartered in the Bronx Zoo in New York City and manages parks and wildlife conservation projects in over five hundred locations around the world. The trip we are taking is open to anyone who wants to do it. However, it is not easy to get to where we are camping. We arrived three days ago, flying from Paris to the capitol, Brazzaville. I have found that the best air service to an African country is generally from the country that colonized it, and DRC used to be the French Congo. Brazzaville is on the Atlantic coast at the mouth of the Congo River, across from the other Congo, formerly the Belgian Congo, famed from Joseph Conrad’s novel, “Heart of Darkness”. From Brazzaville, we go to a private field to board a small chartered plane. Africa is where the planes are old and the pilots young. The twenty something pilot from South Africa climbs into the cockpit. The plane is at least as old as I am and I am on social security!! 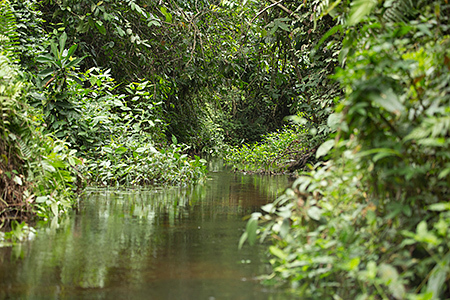 We fly into the interior of the jungle as far as possible. After landing, we hike a short distance to a river. Here we meet up with Ngunda and Benga with two pirogues, wooden canoes made out of hollowed out logs. For three hours, we float down the shallow, narrow river, with the pygmies propelling us along with a long pole they use to push off from the river bottom. I sit in front behind Benga and watch intently as he casually picks a small python out of the water and tosses it to the riverbank. We arrive at a spot where the water is too shallow for even the flat bottomed pirogues. We get out, take our shoes off and walk through the water. This water is clear and only shin deep, not at all alarming as will be the swamp water we will encounter in a couple of days. It is January, 2013, and it is the dry season. Paul tells us the water would be up to our waists in the spring. After two hours, we leave the water and find ourselves on a path that leads to the camp. We hike along this path, single file. Every so often the leader yells out “ANTS” and every one runs and jumps like mad. One time I do not run fast enough or jump high enough and almost immediately I feel burning stings on my calves and thighs. With no modesty, I tear down my khakis and feverishly remove the ants. Three hours later, we reach our destination, Mondika Camp in Nouabale-Nodhi National Park, one of the parks Wildlife Conservation Society manages. The park site is on the banks of the Mondika River. There are six two man tents built on concrete blocks, and each tent has its own-hole-in-the-ground latrine and little shed for bathing from a bucket of river water. These are for the tourists. They are seldom used. There are tents for the WCS employees, a dining tent, an office, and a kitchen tent. The park is in such a dense, unpopulated part of the continent that about five years ago, WCS scientists literally discovered the existence of one hundred and twenty five thousand lowland gorillas. Before this discovery, the scientific community thought less than twenty thousand gorillas existed in the wild. Two troops of gorillas have been “habituated” for study and tourism. This means that over a period of time, the scientists have made the gorillas accustomed to human presence. Initially in the process, the gorillas flee. Then they become aggressive. Finally, they mostly ignore the human visitors observing them, or watch the humans in return. The river is the only source of water. Gnunda, Benga, and others from their tribe cook and clean up. They bring river water in to camp in big plastic containers, boil it, run it through carbon filters, and strain it with little tiny tea strainers to remove leaves and bugs. I wonder why they use such small strainers. No one seems to know. Every bit of food, building materials, cooking implements, and other supplies has been brought in the same way we came. Meals are simple, but the food tastes delicious. Clouds of beautiful white butterflies swarm over the ground where bath water has been thrown. I am told they are seeking salt. Both groups who were out tracking gorillas return to camp about the same time. We all jump in the river, delightfully cool after the heat and humidity of the jungle. Suddenly, Walter, another trustee, surfaces from a plunge under the water, and we all see a black leech at least 4 inches long attached to his shoulder. Another smaller one is on his thigh. I can see panic in his eyes and he starts to yank them off. As a child, I spent summers at my grandparents’ lake home in Minnesota. You couldn’t go swimming without getting leeches there, and we routinely kept a saltshaker beside the shore. I shout at Walter not to tear off the leech, and yell for some one to “get the salt.” Salted, the leeches shrivel up and fall off Walter. This experience does not stop any of us from further river swims. The nights in camp are magical. We all eat together and swap stories from the day’s adventures. There is laughter, joking, and Antonia and I get a lot of mileage out of our swamp adventure, especially since we are the two most senior people there! Solar charged lanterns in the dining tent provide dim lighting. Antonia and I share a tent and we use headlamps and flashlights to return to it after a long, leisurely dinner. We lie on our bunks and listen to the music of the insects in the jungle. We have been together at WCS meetings and functions for years, but we live on opposite coasts and don’t really know each other that well. This trip I learn much more about her. I learn how she met her husband, how she lost her mother when she was thirteen, about the NYC law firm she manages, and how much she loves to spend every Tuesday with her grandchildren. I find myself thinking of her as an old, dear friend. We both have indispensible e-books, which we charge up with solar panels during the day and read from at night. We are both reading “Leopold’s Ghost”, a true horror story about the other Congo. Slavery, exploitation and cruelty too often marked the European colonization and quest for riches from Africa. I borrow extra t-shirts, sunscreen, soap, socks and other necessities from my fellow travelers to augment the meager belongings that were in my carry on with my camera equipment. Some one told me once that you could tell a person’s true character by how he reacts when his luggage is lost. I give myself high marks and thank the others for helping me out as my bag only showed upon my return to San Francisco. After another two days of tracking and trekking, we pack up our things and get into a much larger motorized pirogue. We are going up the Sanger, a deeper, wider river, for twelve hours to the southern part of Central Republic of Africa where WCS has been conducting research on forest elephants for thirty years. We are all a little worried because news has filtered down that rebel forces are fighting around the capital of the country in the north. But that is a story for another day.